These feelings for Cambodia come as a surprise, actually, because so much of what I read beforehand prepared me to fear and even repel her. For example, experts warned against pick-pockets in public places and encouraged visitors to hide items such as phones and cameras when riding in tuk-tuks to prevent locals from reaching in and stealing as they pass. They informed about night market scams and orphanage fraud, active landmines and child labor abuses, unsanitary drinking water and food preparation concerns, dangerous driving conditions and relentless child beggars. Needless to say, we landed in Cambodia with a long list of worries—worries easily passed off as no big deal when traveling alone or with a spouse, but worries that felt a whole lot more ominous when traveling with kids. Once we were on the ground, it became clear, for example, that Cambodia seemed a rule-free land. Picture driving through an intersection in a major city with no traffic lights or stop signs. Visualize trucks, cars, pedestrians, tuk-tuks, and scooters (with entire families riding on them), entering the junction and turning every which way… all at the same exact time. Each crossroad becomes a traffic free-for-all, and yet—miraculously—everyone somehow escapes unscathed. A family of four rides on a scooter. I think the most we counted on one scooter was five. In addition to the lack of road rules, unsanitary conditions permeate the country. 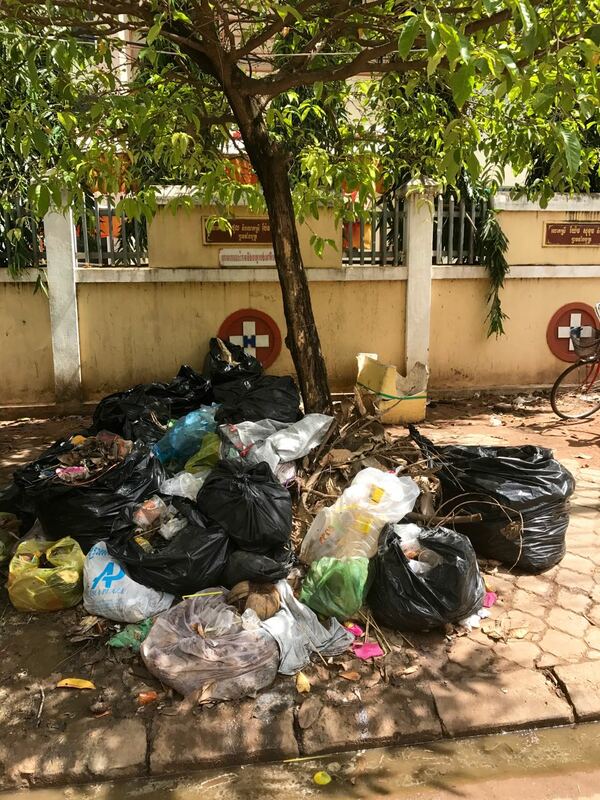 For example, a shocking number of trash piles spoiled many walkways—including sidewalks next to the hospital and alongside the king’s palace in the city. Also, landmines present a real source of concern for Cambodians living in the countryside as an estimated three to five million (MILLION!!) landmines still buried there pose a dangerous risk for unsuspecting residents, including children. 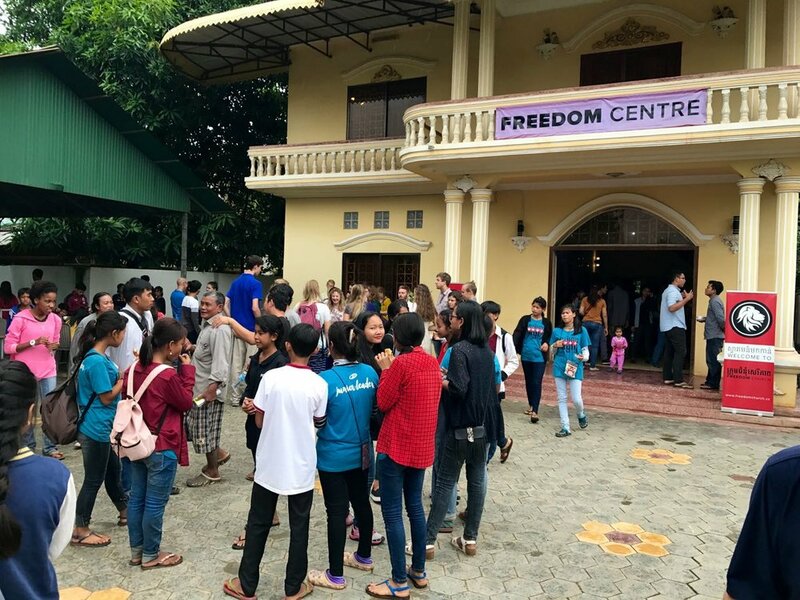 In fact, children currently living at and being cared for by the Cambodia Landmine Museum Relief Center have been impacted by the tragedy of landmine explosions either directly (by loss of limb) or indirectly (by loss of a family member). It's heartbreaking to see loads of trash piled up anywhere, but it was especially difficult seeing piles of garbage outline the walls around the hospital. The Cambodian Landmine Museum impacted us in a big way, as before visiting, we had no idea how landmines still ravage the Cambodian people. The Landmine Relief Center cares for children, some who have lost limbs to landmines. Harrowing artwork displayed in throughout the museum allows visitors to see landmine accidents through the eyes of the children who experienced them. Of course, tragedy on a large scale pervades Cambodia’s recent history with its harrowing story of genocide at the hands of the violent Khmer Rouge between the years of 1975-1979. Therefore, every man or woman around my age—that is, any person over age 40—carries some personal narrative from that time period of the horrific killings and brutal murders of men, women, children, the elderly, the sick, the educated, and the religious. During this time, the Khmer Rouge viciously decimated not only the Cambodian people, but also all her educational, medical, agricultural and religious institutions as well. Children born out of this era valiantly attempt now to pick up the pieces of their broken country, and I can’t help but to look tender at the people here who overcome daily such fresh atrocity upon their friends and relatives. It’s no wonder, then, that poverty percolates on every surface of this beautiful country and hangs like a monkey on the backs of the people. Such obvious deficiency makes it difficult to focus on anything but the destitution here. And yet… in Cambodia, there is a hope that is rising. Which is where our tuk-tuk driver, “Mister Pich,” or “Pich” (pronounced PIE-t), enters our story. Pich lets Eden sit on his scooter when he drops us off at the airport. Thirty-two and married with two little boys, Pich laments that he had to leave school in grade two and vows to keep his boys in school at all cost. He doesn’t allow his limited education to restrict his options, however. Understanding that working in the tourism industry equals more money, he taught himself English and took out a loan for a tuk-tuk and a scooter so he could be a driver. He works with his boys everyday to ensure they do well in school. And he teaches them English. To Westerners, a father working to keep his boys in school sounds normal, but in Cambodia, education is not a guarantee. For some desperate families it makes financial sense to keep their children home from school to sell tchotchkes and t-shirts to tourists or to beg for money, and some parents hand their children over to what are often, unbeknownst to them, corrupt “orphanages” where tourists volunteer to “teach” and interact with impoverished Cambodian children… for a fee. Fraudulent orphanages promise parents that their children will receive education and food, but such promises aren’t fulfilled. Pich could have been a casualty of this crippled and corrupt Cambodia. As a young boy, his parents agonized that they hadn’t the means to feed all of their children, so they sent Pich to live in a nearby temple where he could both eat and study with the resident monks. Because Pich’s health suffered, he moved back home after two years, painfully aware his family still lacked food. So, at age ten (age ten!! ), he moved to Siem Reap and found work with a construction company where he carried bags of cement for $1.25 (USD) a day. He’d send $1 to his family and use the rest to buy food and rent a room. Hope rises as this plot had every earmark for a tragic ending, but Pich took hold of his narrative and chooses daily to rise above his circumstances. Seeing such potential grow out of Pich’s life tweaked our focus and opened our eyes to the “enormous untapped capacity” of this land and her people. Hope rises when, toward the end of our visit and on our way back to the city, Pich suddenly stopped his tuk-tuk alongside the road. He assumed (rightly so) our ignorance about the green grassy field swaying next to us.“Do you know what this is?” No. No we did not. “It’s rice!” he said triumphantly. Pulling a handful of the young plants from the ground, he spoke of how, as a child, he helped prepare the soil, plant the seeds and harvest the grain for his family. He dreams of one day purchasing a small plot of land in the country where he can build a small house and cultivate rice once again. Standing in a rice field, Pich took our picture after schooling us on the finer points of rice cultivation in Cambodia. Hope rises through Cambodia's young adults who understand that while their government fails to provide adequate education, they can (and do!) learn independently. One student at a night market stole glances at textbooks in his lap between customers. When I asked him about it, he explained that he was teaching himself English because in his government school in the country, foreign language wasn’t an option because there were no teachers. Hope rises through the world-famous Aki Ra, a former member and subsequent defector of the Khmer Rouge, who founded the Cambodia Landmine Museum and has cared (and currently cares) for impoverished children in his Landmine Relief Center by providing them food, shelter and education. Selected as 2010 CNN Person of the Year, Aki Ra’s amazing story includes the autonomous disarming of over 50,000 landmines and unexploded war weapons. He continues to serve his people well through the Cambodia Self-Help Demining Organization and Rural School Village Program. Hope rises in Siem Reap’s Tapul Village, where people gather for worship at Freedom Church on Sundays, and during the week, they employ Cambodian teachers who become “Freedom Heroes” by running a school for local students that supplements learning they receive from the oftentimes inadequate government schools. Standing outside after a Sunday morning church service, Freedom Church goers exude hope. Leaving Cambodia, I think it’s fair to say we felt weary wading through the pervasively desperate circumstances but also greatly encouraged by the hope rising out of her proverbial ashes. Desmond Tutu said that “hope is being able to see that there is light despite all of the darkness.” And that is how I’ll remember Cambodia: as a place where the light of hope rises out of a darkness that can’t keep it down.